Andre Ethier is the latest outfielder to hit the free agent market. 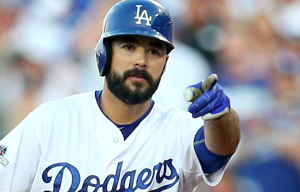 The Los Angeles Dodgers announced Sunday night that they have declined Ethier’s option for the 2018 season. The Dodgers will pay him a $2.5 million buyout rather than invite him back to Los Angeles next season for $17.5 million. The move is not a surprise, as Ethier has been held back by injuries the past two seasons. However, he did participate during the playoffs and drove in the only run the Dodgers scored in Game 7 of the World Series. It’s truly the end of an era for the 35-year old Ethier, who made his big league debut with the Dodgers in 2006. He’s known no other organization for more than a decade and was a constant presence in the Dodgers lineup until injuries kept him sidelined the past two seasons. Ethier had just 58 total at-bats between the 2016 and 2017 seasons. He broke his leg during spring training in 2016 and didn’t return until September. This past season, Ethier was trouble by a herniated disc and didn’t come off the DL until September. However, he did manage to play in the postseason both years. In this year’s playoffs, Ethier was 4 for 13 with a home run. During his tenure with the Dodgers, Ethier hit .285 with 162 home runs and 687 RBIs. Given his injury issues the past couple of years, one has to wonder if this is the end of the line for Ethier. He showed during the playoffs that he may have something left in the tank. However, the back issues that kept him sidelined for much of the season could continue to hinder him. It may still be possible for Ethier to contribute at the big league level in a part-time role. But he may need to sign a minor league contract and prove himself during spring training in order to make an opening day roster next year. As for the Dodgers, their outfield should be in good shape without Ethier. The Dodgers have Yasiel Puig, Chris Taylor, Joc Pederson, and Enrique Hernandez as a starting point for their 2018 outfield. Andrew Toles and prospect Alex Verdugo should also factor into the equation. That group should be enough, although you can never rule out the Dodgers trying to upgrade during the offseason. It will no doubt be odd for Ethier to not be with the Dodgers next year after 12 seasons with the team. But he likely knew that his time in Los Angeles was coming to an end. Unfortunately, it remains to be seen whether or not we’ve seen the last of Ethier in the big leagues.